This 2 piece halo ring set boasts stunning simplicity with a vibrant center stone for an extra boost of brilliance. Made of rhodium plated fine 925 sterling silver. 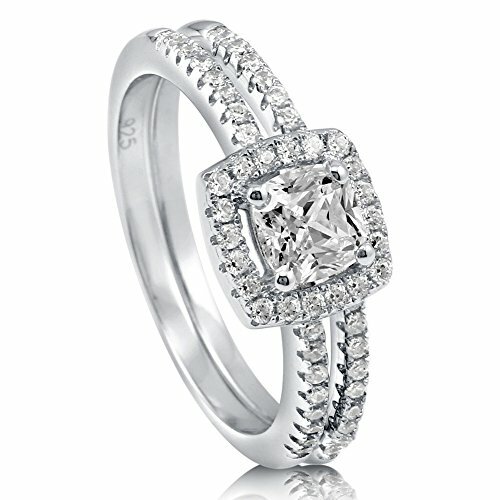 Features 0.6 carat cushion cut clear cubic zirconia (5mm) in 4-prong setting. Accented with 0.285 ct.tw round cut clear cubic zirconia in micro pave setting. Bands measure 3mm in width. Imported. STYLE: This 2 piece halo ring set boasts stunning simplicity with a vibrant center stone for an extra boost of brilliance. STYLE: Petite - This ring is dainty with small carat weight. Engagement - Ideal for engagement, this ring will be perfect for your special one.